We were given an abundance of mandarin oranges several days ago. Everyone in our family loves them so we were eating them daily. However, there were so many I was afraid they would ruin before we could finish them. What to do? Pull out the water bath canner! This is super easy and would be great for a beginner that wasn’t sure what to do. All I did was peel the oranges removing as much of the pith as possible. Separate into segments and place into your clean, sterilized jars. Cover with boiling water (or simple syrup* ), place the lids and rings. Put the jars into a boiling water bath canner, making sure the water completely covers the jars by one to two inches. Return to a boil and let stay for 15 minutes. When the 15 minutes is finished, remove the jars and place on a towel to cool completely. After 24 hours, remove the rings and place in your storage. 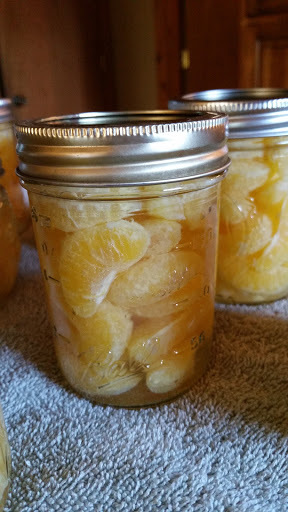 * These mandarin oranges were very sweet so I decided not to add the additional sugar. If you prefer, you can make a simple syrup by using a ratio of 2:1 water to sugar, heated until the sugar is completely dissolved.